Greece is a formable nation in the Balkans. The following event fires only if neither Greece nor Byzantium exists. It removes all Byzantine core provinces and instead it adds cores for Greece in Morea, Northern Greece and Macedonia. With the Byzantine Empire reduced to a distant memory most Greeks have come to lead their lives under foreign rulers. Some have left their old home region altogether as merchants or to serve in the various courts of Europe while most remain in Greece, leading lives in the countryside similar to before the fall of the Empire. Others even thrive under their new rulers. The independent Greek identity has however remained strong, and will in time make itself even more known among the unruly mountain Klephts or by the patriot dreams of intellectuals in foreign lands. While restoration of the Byzantine Empire remains an unattainable dream many have come to yearn to be free of the rule foreign tax collectors and hope for a new Greek state centered on the ancient homeland of their people. does not have Greek or Pontic as primary culture. has an administrative technology of at least level 20.
owns a province of Morea, Northern Greece or Macedonia that has Greek culture. Greece and Byzantium do not exist. This event fires only once during a campaign. Every province in Morea, Northern Greece and Macedonia becomes a core province of Greece. then it gets Greek culture. then Kastoria (1853) gets 4 local unrest. Byzantium loses all its core provinces. All nations (except the Holy Roman Empire, the Papal States, the Ottomans and Byzantium) with Greek as primary culture can form Greece. For years Hellas has been divided among several kingdoms or occupied by foreigners at the pleasing of our common enemies. To unite the Greek lands under a sole flag and one ruler, is our only way to greatness. is not the Holy Roman Empire, the Papal State, the Ottomans or Byzantium. has Greek as primary culture. Byzantium and Greece do not exist. Epirus (144), Morea (145), Athens (146), Naxos (164) and Achaea (1773). gets permanent claims on every not owned province in Western Aegean, Northern Greece, Morea and Macedonia. then Athens (146) becomes the capital. 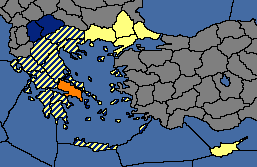 Provinces in yellow must be owned and cored to form Greece. Provinces in blue are permanently claimed after formation. Have a good strategy for Greece? Form Greece and own and have cores on Zeta, Thatta, Lamba, and Roh. ↑ For the script code of the event see in /Europa Universalis IV/events/falvorGRE.txt. ↑ For the script code of the formation decision see in /Europa Universalis IV/decisions/MiscCountryFormations.txt. This page was last edited on 22 December 2018, at 13:02.